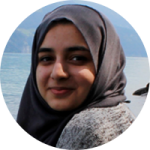 Khadija Raza studied BA Design for Stage at the Royal Central School of Speech and Drama, and is interested in working in theatre, opera and site-specific performances. Previously, she has assisted Annemarie Woods on L’heure Espagnole and Gianni Schicci (Opera Nationale de Lorraine), James Cotteril for the British Youth Opera on English Eccentrics and Owen Wingrave (Peacock Theatre), and Geraldine Pilgrim on her site-specific, promenade piece, Well (Sanofi Factory, Dagenham). Currently, Khadija is Assistant Designer to Rosie Elnile on The Unknown Island (Gate Theatre).